In the Acting For The Dancer Workshop students will learn the fundamentals of acting technique and how to apply them to their dance performance. The workshop will include an introduction to acting lecture, instruction in acting exercises and a Theater Jazz technique. Our workshop will end in a joyous, energetic dance allowing the dancers to utilize all the strategies and techniques learned throughout the day. 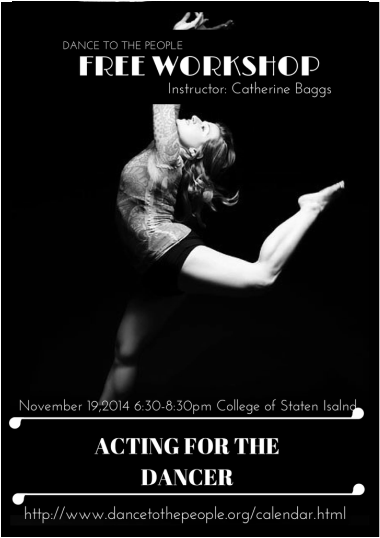 Catherine is a Dancer, Choreographer, and Educator working in the NYC area. She holds a BA in Music Theatre/Mathematics from American University (2006). and an MA in Dance Education from New York University (2012). Catherine's Dance company Aries In Flight believes in creating Theater Dance Professionals who are not only equipped with skills for a successful career, but a successful life. To accomplish this she has created a unique program that combines Health/Nutrition, Dance Technique, and Life Coaching.